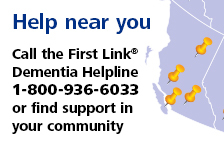 Understanding dementia | Alzheimer Society of B.C. Family caregivers can prepare for the journey with dementia by understanding the way Alzheimer's disease progresses. This workshop focuses on symptoms and reactions that are likely to arise throughout the different stages of the disease.